Mitaka (三鷹市 Mitaka-shi) is a city in western Tokyo. The main attraction for foreign visitors is the Ghibli Museum, while for Japanese the main attraction is Inokashira Park, in which the museum is located, particularly during cherry blossom (hanami) season. The main walk is from Mitaka station along Tamagawa Aqueduct to Inokashira Park, then to the Ghibli Museum, or from Kichijoji through Inokashira Park. For a longer walk, one can start at Inokashira Park station (Inokashira Kōen) and walk the full length of the park. Mitaka is a major stop on the JR Chūō Line (中央線). Chūō trains depart from Tokyo Station (¥380) and Shinjuku (¥210). Chūō Special Rapid (中央特快 Chūō-tokkai), Ome Special Rapid (青梅特快 Ōme-tokkai), and Commuter Special Rapid (通勤特快 Tsūkin-tokkai) trains run to Mitaka quicker compared to regular Rapid trains. Mitaka is also the end point of the thru-service connecting the Tokyo Metro Tozai Line (東西線) to the Chūō via its terminal at Nakano. Kaiji (かいじ) limited express trains stop here once every 1-2 hours on journeys between Shinjuku, Otsuki and Kofu. The Azusa (あずさ) limited express stops here in the morning on runs to Matsumoto, and stops late at night on the way back from Matsumoto to Shinjuku — otherwise you will have to travel to either Tachikawa or Hachioji to pick up the westbound Azusa. These trains require a surcharge on top of the regular fare. Japan Rail Pass holders can travel on these trains for free; seat reservations in reserved cars are optional. 35.696233139.5704311 Ghibli Museum, 1-1-83 Simorenjaku (15 minute walk along Tamagawa Aqueduct from Mitaka Station or through the park from Kichijoji Station, or ¥300 bus ride from Mitaka Station (directions) (map)), ☎ +81 570-05-5777, e-mail: museum@ghibli.jp. 10AM-6PM. 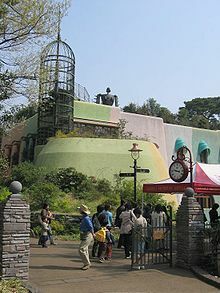 The Ghibli Museum has permanent exhibitions showing the history and science of animation, as well as a mock-up animation studio showing the animation process, and features characters from Studio Ghibli films throughout. There are also special exhibitions, a cinema showing exclusive Ghibli animated short films, a store, a rooftop garden, a restaurant, and a catbus (for children ages 12 and under). The space itself is intricately decorated, notably with Ghibli-themed stained glass and accents, and features many nooks and crannies to explore. A purchased reservation is required before visiting. All reservations for a given month are sold on the 10th of the month before and sell out within a few days. Reservations can be made at any Lawson convenience store within Japan, or through Lawson's online ticketing interface accessible in English through the museum's website. ¥1000 (adults; less for children, depending on age). 35.701928139.5608232 Mitaka City Gallery of Art (三鷹市美術ギャラリー, mitaka-shi bijitsu gyararī), CORAL 5F, 3-35-1 Shimorenjaku (In the top floor of the Coral Building, adjacent to Mitaka Station. ), ☎ +81 422-79-0033. 10AM-8PM. Features special exhibits four times a year. 35.675194139.5378333 National Astronomical Observatory of Japan (国立天文台), 2-21-1 Osawa (This is far from any train station. Take bus #91 from Musashisakai to the Kokuritsu Tenmondai-mae bus stop. ), ☎ +81 422-34-3600. 10AM-5PM. This is the main campus of Japan's national observatory. Data collection mostly occurs elsewhere, which frees up many of the buildings here for a view. About half of the campus is open to the public. Many buildings are decades old and house equipment used by the observatory decades ago, in a well-preserved state. The entire place is surrounded by forest, and unlike much of Tokyo, it's quiet and peaceful here. Some people bring a sketch pad and draw the buildings. There are no guides. A self-paced tour might take 1-2 hours. free. 35.70004139.576691 Inokashira Park (井の頭公園) (A few minutes' walk from Kichijōji Station and Inokashira Kōen Station.). A pond with boats, petting zoo and a small aquarium, and is a place where vendors, musicians, artists and street performers gather. The park is bustling with crowds who arrive to take in the lively environment on weekends and holidays, especially during the cherry blossom season when the entire park is overrun with visitors for hanami. There is also a small temple dedicated to Benzaiten, a vengeful goddess of love. 35.698131139.5613592 MISHOP, 3-30-12 Shimorenjaku (On the main street about 5 minutess' walk south of Mitaka Station. ), ☎ +81 422-43-7812. The Mitaka International Society for Hospitality is an association for cultural exchange between Japanese volunteers and international visitors. It hosts various cultural events and also operates fee-based Japanese lessons. Alternatively, a system for connecting students with volunteer language partners is available for those who wish to learn Japanese on the cheap. Membership fee ¥1000. 35.702459139.5609811 LONLON (In Mitaka Station). While not as big as the one at Kichijoji, there is a bakery, food, a restaurant, a couple beauty/salon stores, and a flower shop. 35.701928139.5608232 Coral Mitaka (コラル三鷹) (A mid-size building just to the south of Mitaka Station.). Home to many small shops, selling items such as clothing, groceries, specialty food, and other items. Additionally, there's an art gallery on the top floor. 35.701886139.5611771 Domadoma (土間土間), 3-26-10 Shimorenjaku (From the south exit of Mitaka Station, go south about 50m, and find this place on the east side of the street. ), ☎ +81 42-270-2322. 5PM-5AM. This izakaya, which serves standard izakaya fare, mainly caters to groups with reservations. ¥1500-3000. 35.704273139.561373 Indra (インドレ) (A block off the main Chūō Dōri street. About 10 minutes' walk north from Mitaka Station. ), ☎ +81 422-52-2060. An Indian restaurant. 35.703398139.5612734 terrasse verte (テラス・ヴェルト), 2F Nakamachi 1-14-5 (From the north exit of Mitaka Station, go 100m NE. The restaurant is on the 2nd floor on the corner. ), ☎ +81 422-38-1150. M-Sa 7AM-11PM, Su 10AM-10PM. This cafe has a selection of western-style sandwiches, pastas, salads, and desserts. There are both indoor and outdoor seating areas. ¥500-1500. There aren't many cheap hotels in the area, but the Chuo Line makes for quick access to other parts of Tokyo that have them. Budget fast and light travelers could stay overnight in a net cafe, though speaking Japanese is a must. For more upscale hotels, neighboring Kichijoji is a good place to look. 35.70311139.561221 wip (ワイプ), Nakacho 1-14-11 (From the north exit of Mitaka Station, go 50m east. Follow signs from in front of the building to the elevator, and take it to the 7th floor. ), ☎ +81 422-59-1588. 24h. This net cafe is fairly quiet. ¥800 for 3 hours, ¥1300 for 5 hours, ¥1700 for 10 hours. One train stop to the east is Kichijoji, with young and vibrant night life. To the north and west, respectively are Musashino and Koganei, quieter places which might be nice for a walk or bike ride. By train, Shinjuku is about 15 minutes away, Shibuya is 20 minutes (via Kichijōji), and Tokyo Station is only a half hour ride. Those three train stations are some of the largest in Tokyo, and from them you can go most anywhere in the country. This city travel guide to Mitaka is an outline and needs more content. It has a template, but there is not enough information present. Please plunge forward and help it grow! This travel guide page was last edited at 14:06, on 14 January 2019 by Wikivoyage user Traveler100bot. Based on work by Wikivoyage users JRHorse, Ikan Kekek, Fabimaru, Syced, Wrh2Bot, 隼鷹, Douglaspperkins and WOSlinker, Wikivoyage anonymous user 124.144.161.135 and others.